Isn’t it great how websites have taken over the world? Why- you ask me? Well if you believe some intellectuals; they say if your business does not exist online, it does not exist at all, period. The internet is where you find people; therefore, it is naturally the best way to find new companies and businesses as well. It helps save energy and precious time. Websites are a greater approach in today’s time if you want to present yourself to the online world. You need to ensure that your site gives the right impression of what you’ve got to offer. It needs to be executed effectively and impress the viewers. 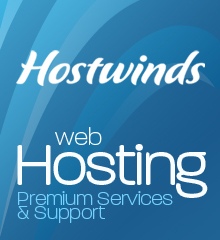 In order for your site to perform well, you must choose your web hosting warily. Always remember- your website is your persona in the internet market. One small fault could lead to several casualties. 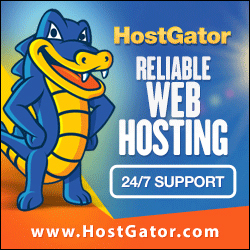 Go for a web host which provides premium quality and grants assurance that your website will never face issues regarding downtime whatsoever. Speaking of, I recently tried out yet another web hosting company. 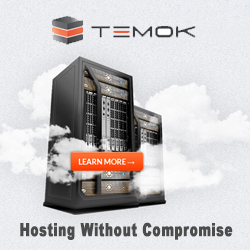 As you know, I have a lot of website projects going on so I keep experimenting with web hosting packages now and then. In this article, I will review Buzy Bee Hosting, a web hosting provider I stumbled across by mere coincidence. After trying out their interesting packages for about a couple of weeks, I decided I should write in detail about the features I liked best. Buzy Bee Hosting is a US-based web hosting company which has been in the business for well over 9 years. Having been established successfully as a web host in 2010, Buzy Bee Hosting has risen to prominence after serving top-notch services. Their approach to purchasing the servers instead of renting them contributes to the fact that their servers are indeed powerful and steady. 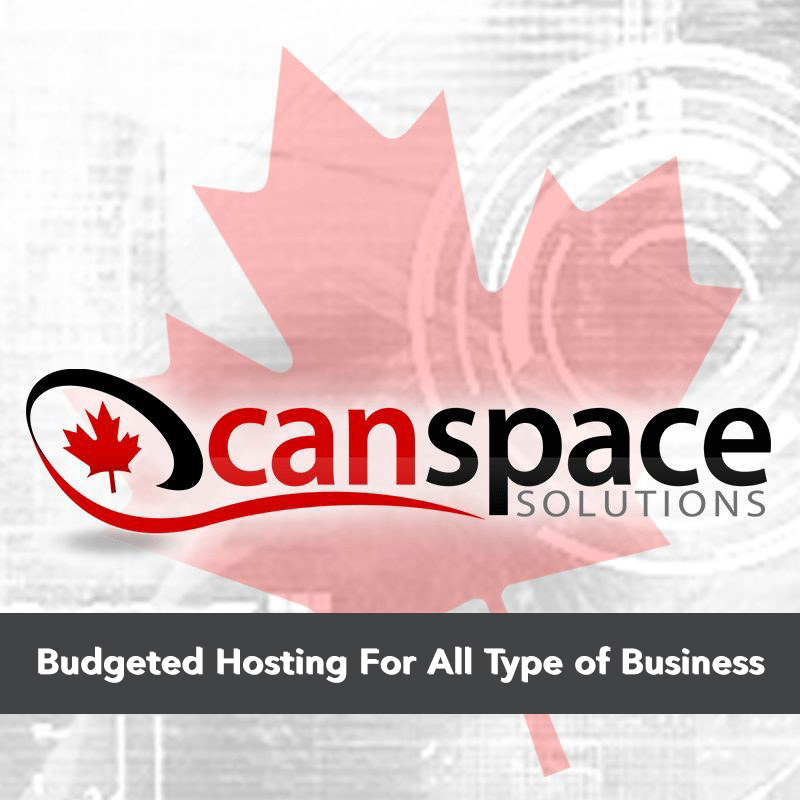 The silver lining of Buzy Bee Hosting is a wide variety of hosting packages offered by them. 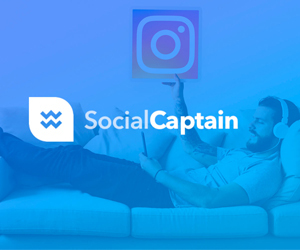 They do not specialize in a particular form of hosting; instead, the team believes in being flexible and granting the customer exactly what he requires. One of the most important aspects to note while purchasing a new web hosting plan is the uptime/downtime response. After all, you wouldn’t want your website to face downtime, would you? I don’t think so. If your site is facing downtime, it means your web host isn’t secure enough to offer 100% availability. If your site is offline more often than it is online, suffice to say it could be hazardous for your reputation. Buzy Bee Hosting guarantees utmost uptime SLA in all of their hosting plans. Throughout my personal experience with Buzy Bee Hosting, I noticed very little to no downtime on their servers. 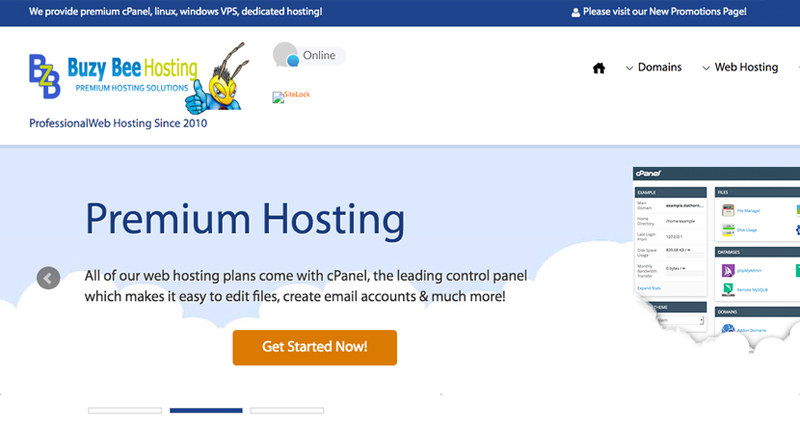 After I first purchased Buzy Bee Hosting’s managed hosting plan, I was initially a tad nervous about the whole installation façade. What can I say; the activation and setup make me anxious. I have had the unfortunate fate of being acquainted with web hosts that required several lengthy steps of installation. I don’t have the time for it, or the energy if I’m being honest. 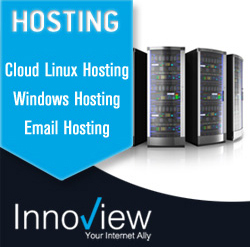 I was looking for a hosting package which provided instant activation. 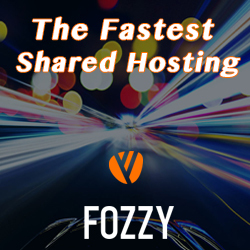 With Buzy Bee Hosting, you can immediately get down to business in no time at all. Along with that, Buzy Bee installs scripts such as WordPress in just 3 effortless and hassle-free steps. Buzy Bee also optimizes on cPanel/WHM so it was effortless for me to get used to the control panel within minutes. Free Migration is another solid feature that Buzy Bee Hosting offers. There comes a point in everyone’s hosting experience, where you just can’t help but be fed up of your current host. I’ve come across many providers which promise gems and diamonds in the beginning, but as time slowly progresses the gems and diamonds soon turn into rocks and pebbles. I wanted a web host which would migrate my website without charging me anything additional other than the hosting package. Buzy Bee Hosting thankfully migrated almost 120GB of data with utmost ease. If you are concerned about a timely migration, take my word for it; the speed at which Buzy Bee Hosting migrates your data to their servers is amazingly rapid. 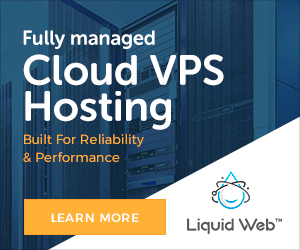 Throughout my decade long experience in the hosting market, I’ve come across very few web hosts which provide free backups facilities. Web hosts either charge extra for backups or even when they do include free backups in the hosting plan, the web hosting package itself is always overpriced. Buzy Bee is one of the very few hosts which enables the users to backup their entire database on a daily basis. Data is my most precious asset and I cannot bear to lose it at any cost. Thanks to Buzy Bee’s hosting plans, now I feel safer handing my data over to them. Support is something which should always be handled with care, no matter what service you’re providing. Your customer needs to feel secure and satisfied with your services. If a user has a query, the team must sort it out as soon as possible. These are some core values which very few providers exercise. Buzy Bee, on the other hand, understands it and believes that happy customers mean successful upshots for the company. 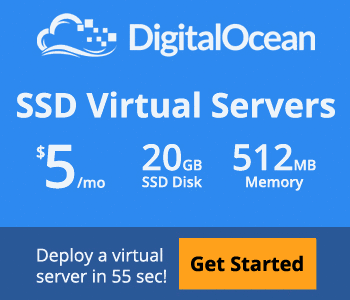 Buzy Bee’s SSD shared hosting is starting at just @2.58/mo. Buzy Bee’s Linux VPS is starting at $9.97/mo, Windows VPS at $24.97/mo, and Managed VPS at $29.97/mo. 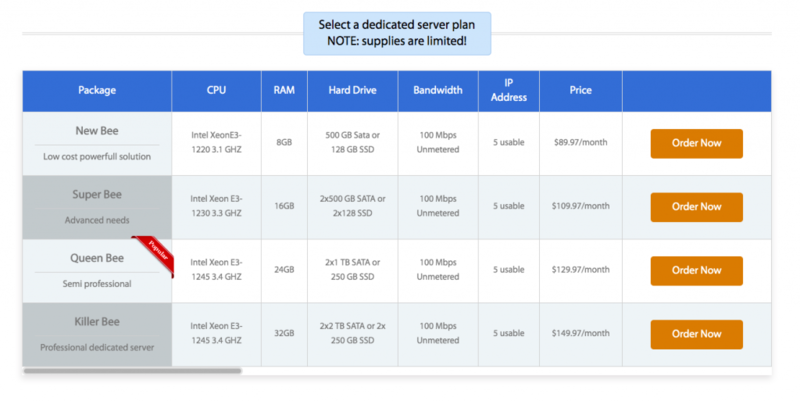 Buzy Bee’s Dedicated servers are starting at just $89.97/mo and Managed Dedicated servers at $129.97/mo. Buzy Bee’s SSD reseller hosting starts at $3.23/mo. You can avail Buzy Bee Microsoft Exchange Business email plan at $6.97/mo. 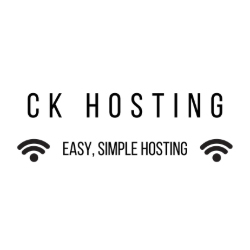 There you have it; a detailed review of Buzy Bee Hosting. I’ve narrowed down everything you need to know about the company. But let’s walk down the memory lane and in a quick recap, let’s go through everything they are offering once more. Buzy bee offers 99% uptime response along with the leading cPanel/WHM control panel. You get instant activation and get rewarded with several 1-click installs and pre-installed scripts. They migrate your website for free and offer friendly support 27/7. Sure there are a few catches. Once, some of my data got deleted sans any warning. Though the saving grace was that due to the daily backups facility, I was able to restore it back again. The question is; is Buzy Bee worth purchasing or not? Well, considering the number of packages it offers, I say why not? Give it a try and let me know what you think. I thoroughly enjoyed my time with Buzy Bee Hosting. Buzy Bee Hosting is a US-based web hosting company which has been in the business for well over 9 years. Having been established successfully as a web host in 2010, Buzy Bee Hosting has risen to prominence after serving top-notch services.